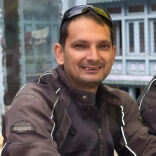 Hi, my name’s Atul Bhardwaj – and thanks for visiting AB Original Tours. An Aussie bloke who toured with us mentioned that an ‘origin story’ on my website would be a good idea. I was born and raised in New Delhi, but after completing my formal education I grew tired of the city and wanted to experience the rest of my home country. Setting off across the sub-continent on buses, trains, bikes and even my own two feet, I traveled to popular sites, explored off the beaten track, and ended up in places I’ll most definitely return (and some I most definitely wont). I ate with locals, shared beers with tourists and fell in love, a little bit more, with the country I grew up in. And then it hit me. There’s only one way to see the real India – on the back of a motorcycle! The freedom, the views, the experience…breathtaking! But it was also frustrating. From unreliable rentals to dodgy local mechanics, touring India on a bike was much harder than it needed to be. After months of research, I found the only adventure motorcycle tours offered by locals were run haphazardly and priced exorbitantly. While all others were run by companies from other countries (sometimes acting just as “agents” and making hefty commissions in the process). So I did. AB Original Tours is a culmination of my passion for adventure, my love for India, and my desire to share it with you, whilst providing a higher standard in value and making only fair profits in the process. Check out our range of adventure tours here. The open road beckons. Hope to be riding on it with you soon. P.S: You can be “friends” with me on facebook and also meet hundreds of people who have been on my tours… Click here.